The King Center in Atlanta — set up to preserve the legacy of civil rights leader Dr. Martin Luther King — says his oldest child, Yolanda Denise King, has died. Steve Klein, a spokesman for the center, says the 51-year-old died late Tuesday in Santa Monica, Calif.
A spokesman for the King Center says the family does not know the cause of death but suspects it might have been a heart problem. The death comes just over a year after the death of her mother, Coretta Scott King — a civil rights leader in her own right — at the age of 78, of complications from ovarian cancer, and after a battle with the effects from a stroke. The children of Martin Luther King and Coretta Scott King — Yolanda Denise, Martin Luther III, Dexter Scott, and Bernice Albertine — have each in their own way worked to carry on their parents' work fighting for racial equality and social justice. Born on Nov. 17, 1955, in Montgomery, Alabama, King was just an infant when her home was bombed during the turbulent civil rights era. As an actress, she appeared in numerous films and even played civil rights heroine Rosa Parks in the 1978 miniseries "King." She founded a production company called Higher Ground Productions. Speaking last January in Atlanta at Ebenezer Baptist Church — where her father preached for many years — Yolanda exhorted those observing the national holiday that bears his name to remember that America has not yet achieved peace and racial equality. "We must keep reaching across the table and, in the tradition of Martin Luther King Jr. and Coretta Scott King, feed each other," said Yolanda, urging those who honor the Kings' work to question their own beliefs on prejudice and be a personal force for peace and love. 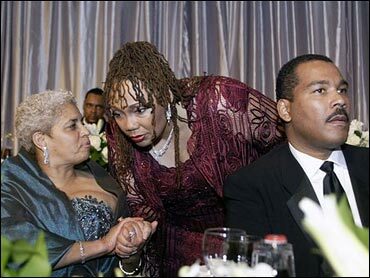 Yolanda at that same ceremony used her craft as an actress to deliver a tribute to her parents, performing a series of skits telling stories including a girl's first ride on a desegregated bus and a college student's recollection of the 1963 desegregation of Birmingham, Ala.